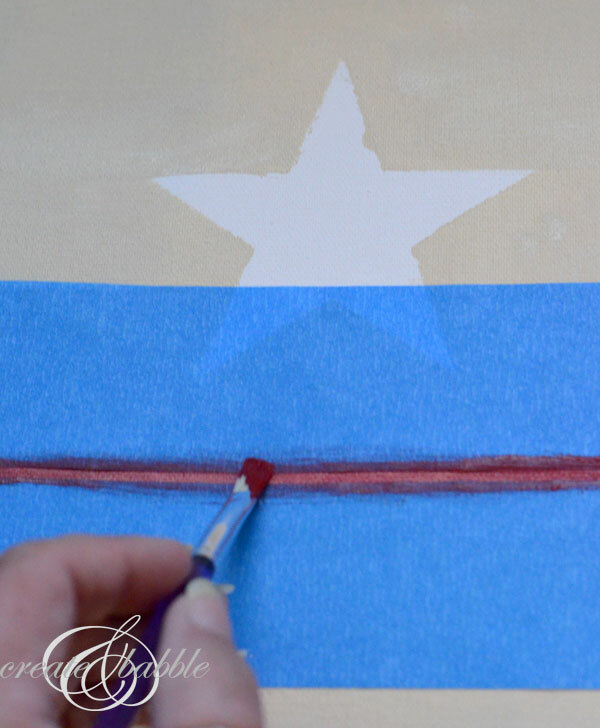 Here’s a quick and easy DIY Canvas Flag you can make in no time. With Memorial Day weekend coming up, that means picnics and barbecues and lots of red, white and blue! 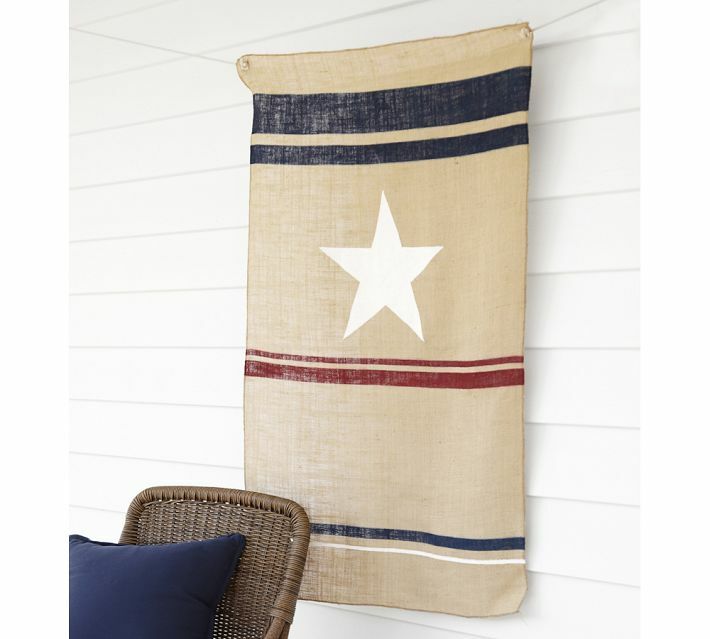 As I was browsing the Pottery Barn site, I came across this Burlap Hanging Flag. I really liked the simplicity of the design and although $34.50 is not a bad price, I knew I could make something similar for a lot less or better yet, nothing! At first I thought I’d buy some burlap but as I was looking around my craft room, I spotted some canvases that I’ve had laying around and thought, why not? 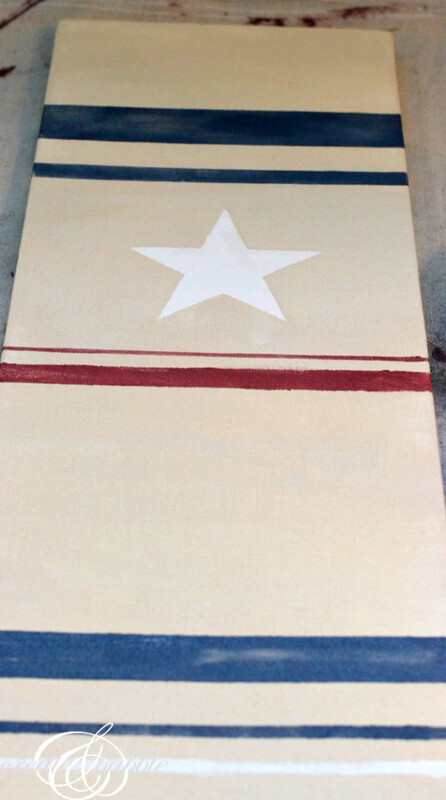 On the plain canvas, I placed the star template and painted the entire canvas with a beige colored paint covering the star so that it would be the original white canvas color when removed. Make sure to paint the edges of the canvas, too. Don’t worry about being real neat or precise with the painting, you don’t want it to be perfect-looking. Using the PB photo as a guide, I made red, white and blue stripes by placing strips of painters tape to mark off my stripes. 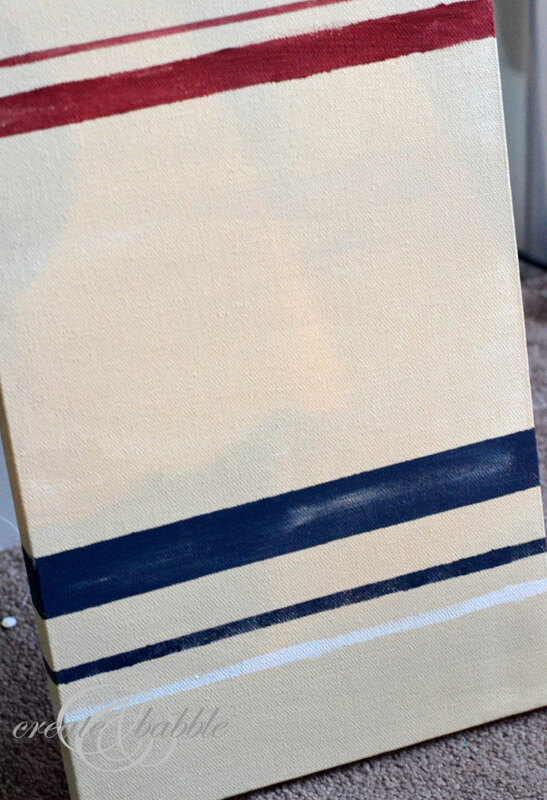 I wrapped the tape around the edges of the canvas so the stripes would continue around the edges, too. 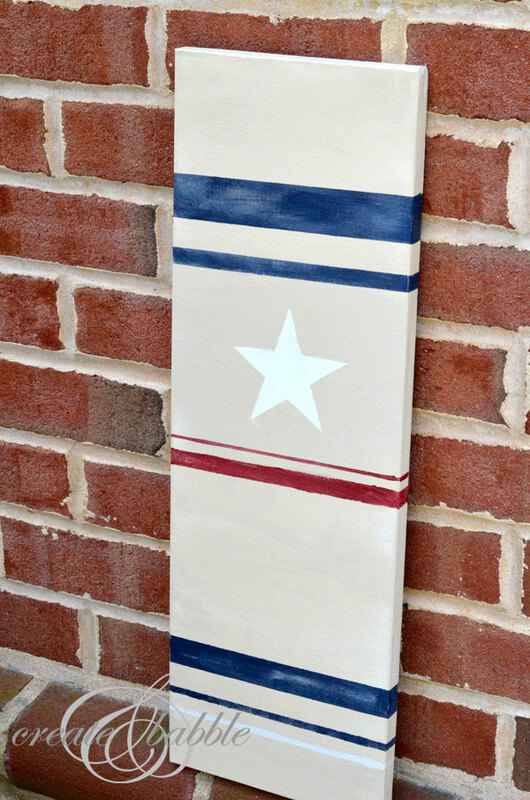 I wanted the stripes to look a little shabby and worn, so I made sure not to paint thick, even stripes. 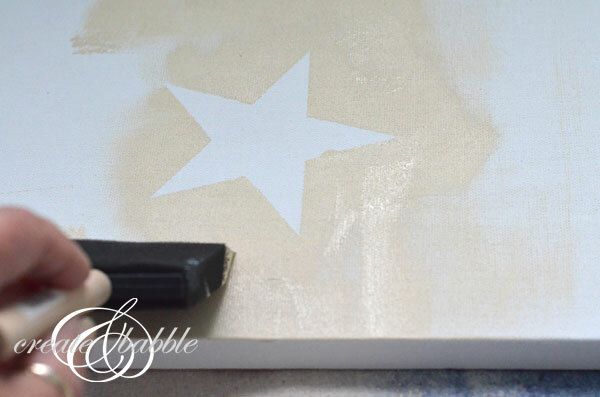 You can see in the photo above that some paint seeped under the star template. No big deal. I just went back with a small paint brush and cleaned it up with white paint. And here it is all finished. It took about 20 minutes and cost $0! My kind of craft! 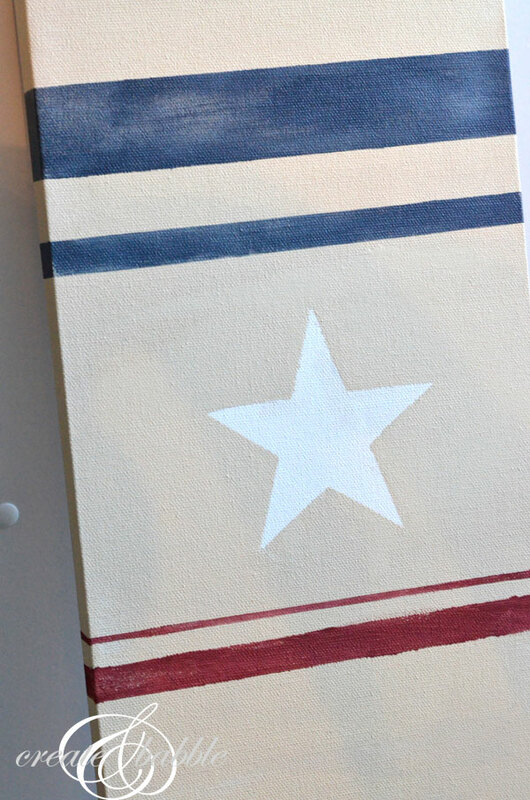 What a cute, simple, patriotic project. I’m always looking for ideas like these. Thanks, Jeanie. This is so cool! I have some extra drop clothes around, which I use for everything from curtains to slip covers, and I think this will make a great background. I can swap out the star for a maple leaf! Love this!! I just had my daughter run to the store for red paint so I could work on a Memorial Day project, wish I would have asked her to get me a canvas too. Just stopping by to say thank you for the follow on Pinterest! I really appreciate it and I’m following you back ;o) Hope you have a great night! very cute! New follower :). Glad to be on CEDDT with you! Thank you Robin! I’m looking forward to getting to know everyone!